A GeekyMomma's Blog: Have We Met? It's been a really long time since I've blogged about Twitter. Mostly because Twitter has become so mainstream that there's almost no need for folks like me to keep spouting the benefits of its use. I've pretty much figured out that either you "get it" or you don't. The process of trying to convince people to give it a try, when they've already made up their minds that Twitter is a waste of time, is well... a waste of my time. Don't get me wrong; I still strongly believe in its use for networking and fun but I've evolved to the point where it's just too exhausting trying to drag in reluctant people only to find them two months down the road, having given up. Having said that, I have no problem sharing that Twitter has changed me in many ways. Using Twitter has made me think very carefully about social networking in education and allows me to speak intelligently about its use in the classroom. Twitter has also afforded me the opportunity to make some connections that have led to some life-changing events and opportunities, as well as friendships. All would definitely not have happened outside of this use of social media. There are so many people that I've connected with over the years that it's really difficult to remember our first connection, but I'm going to try. I'm deliberately only naming a few because if I try to name everyone who is important to me online, there would be way too many and I'll likely leave out someone very important. Please don't be insulted if I forget you. Leave me a comment and remind me of how we met. I challenge you to write your own blog post doing the same. Be good to the Blogosphere and be sure to link back here and also reference Dean in your post; then challenge others to do the same and link back HERE and to YOUR POST. Here is when I met Dean for first time. Joyce Valenza and Mark Wagner - EdubloggerCon 2009- It was an un-session that Mark Wagner was conducting on how to Jailbreak your iPhone. Joyce was brave enough to let us all watch as she went through the process as Mark explained. I broke out my Flipcam and filmed the whole process and later on edited it for Mark and sent it to him. Since then, Mark and I have connected at future conference and Joyce and I have also connected at many conferences and have enjoyed a few dinners out, vendor parties and good times. Here I am with Teryl; about to get lassoed. Rob Bayuk - Rob followed me on Twitter and reached out to me to guest post on his TeacherTech blog over at Microsoft. 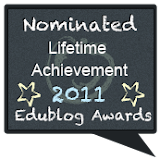 I'm pretty sure it was when he was running a contest where he had a few edubloggers compete for the most comments. I think Vicki Davis was one of them, but I don't think that is where she and I first connected (thus her name on the list at the end). 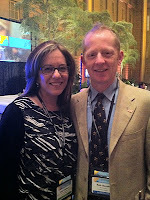 Since then, Rob asked me to judge the US Partners in Learning Forum and then again, recently the Global Forum. 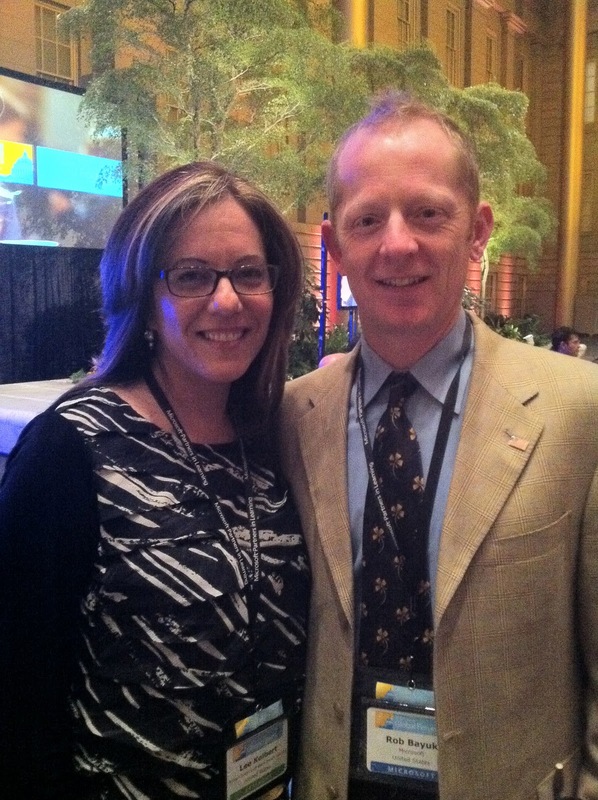 Both were amazing events for which I will forever be grateful to Rob and all the folks at Partners in Learning. And it all started on Twitter. 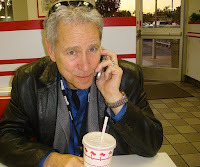 In and Out Burger - My first time in California was at the Innovative Learning Conference (2008) and all over Twitter my friends were telling me I HAD to try these awesome burgers. Verdict? Meh! But my companion was great fun. Speaking of the Innovative Learning Conference, it was there that I met two amazing women who have had an impressive impact on education. 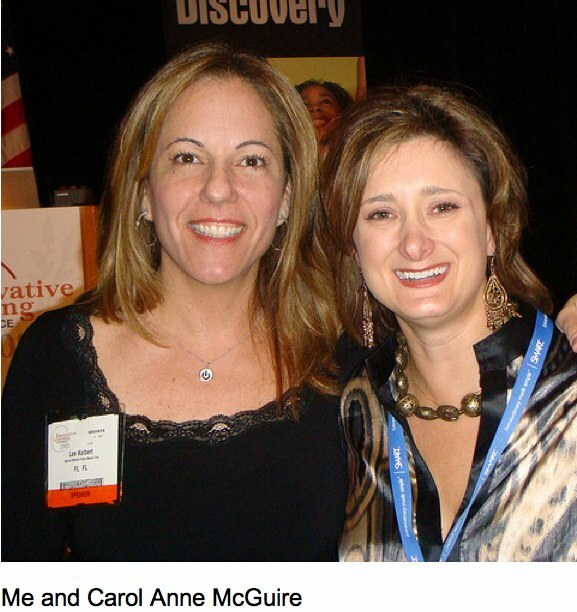 Carol Anne McGuire and Colette Cassinelli. Carol Anne and I met through some mutual friends at Discovery Education, she was also the closing keynote at ILC and we connected right away; spending much of our free time at ILC romping around together and staying in touch since. Colette and I were first online Twitter pals, but met in person at ILC and have since worked together to give a presentation at ISTE and continue to stay connected, as well. Readers: I challenge you to write your own blog post doing the same. Be good to the Blogosphere and be sure to link back here and then challenge others to do the same and link back HERE and to YOUR POST. Leave me a comment letting me know that you've written your own blogpost about this please. Thanks! Here's the crazy part, Pal: We haven't met in person yet! I've enjoyed your friendship, cheerleading and support for so long that it just feels like I "know" you in a physical sense. I can't remember our first digital interactions, but I remember being star-struck because you'd found something I'd written and decided to share it on the Palm Breeze Cafe. I was new to digital spaces and that was one of the first times that I felt that my work had merit and might just be able to stand on its own beyond my classroom. I owe you a beer for that. Rock right on -- and someday we'll have to cross paths in person. So many of the folks listed, I've also not had the pleasure of meeting in person yet, but you're right that it feels like we have. I know I shared your Pageflakes site once on PB CAFE (and mentioned you a few other times), but before that you and I did a podcast radio show with Ben and Steve for Voicethread. But, I still think we go back even further. And... I'll take that beer when (not if) we finally meet! You know ... I don't know either. I imagine it was Dean who helped me make connection to your work at some point, but can't put my finger on it. Still hoping to meet you one of these days! But in all seriousness, I can't for the life of me figure out when we first met! I'm thinking it was either a DEN event or at FETC, but can't think of the details. Can you? OMG Steve! I knew I'd leave someone out! But YOU??? Shame on me! I DO remember! It was a DEN event and the theme was baseball. You presented. I think you were still a kdg teacher or at least brand new to the DEN. Was it in Orlando? Karen Seddon was there. I do remember meeting you at The Sidwell School. You were very friendly. But I still think we had some online interaction prior. Can't remember. I'm sure it was Dean that created our connection and I'm happy for that. I'm thankful for both of you! Carol Anne McGuire! She and I taught at the same school years ago. She was the VI teacher. My goodness, is she ever innovative and creative. I was a new teacher at the time and in awe of her talents. I recently saw her keynote at the CUE Conference in Palm Springs. I'm sorry our paths keeping missing each other. Whatever your other plans were for DC, you should have changed them. :) Next time.... do it. I hope I'm there with you. Lee, how about this one? I think you were the first person I really connected with on Twitter -- I mean back and forth @ messages and even a few DMs. We've never met in person, though. You were kind to me, when I asked about professional development opportunities and other education topics. 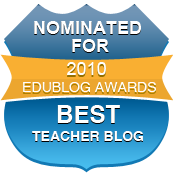 Because of those Tweets, I even used one of your videos on my site, www.learnitin5.com. I was hoping we'd meet at ISTE last summer, but you couldn't make it. Back in my early Twitter days, I followed you and a handful of others on your list and had a few dozen followers of my own. I've now spent time with and befriended Angela Maiers and met Alec Couros and Dean (at ISTE and only briefly, so I doubt they remember). Today, I follow hundreds of great educators, have over 1,500 followers and even teach an online course about using Twitter to improve education. I owe a lot of this to you. Thanks to you and to Dean for this walk down memory lane. And now you've sparked an idea for me I'll likely blog about. When it comes to our face to face connections are relatively easy to trace origins. I think it's important or at least interesting to retrace our steps occasionally and ask, "how do I know that person?" Not only does it refresh and renew our ties, but I also think its useful as we help others see value in these connections. For me, it's usually one of three things that initiate these connections. 1. I read something that resonated. Something that made me think "this is someone I can learn from". Sometimes it's a like minded idea and sometimes it's something I hadn't considered and even something that makes me mad. 3. Someone who makes me laugh. Not much different than other connections and relationships. But somehow exploring the way these evolve online is a little different. I was trying to think about a post you wrote that stuck with me. I think it was a link to the Palm Beach Cafe that I first encountered you. I remember thinking what a great job you did and what a great concept that was. Thanks for writing about this. I think it's good thing to do. Hmmm, have we met.....I am unsure....but it feels as if we have?? But now I am second guessing myself. If yes, then where?? Perhaps Educon 2008 or NECC 2005, 06, 07?? And now I feel silly! Indicating that perhaps we'd met before that? I definitely remember us talking about Voicethread in San Antonio, though! I was a total Newbie at NECC in 2008. I was only following the blogs of a few people at that time and you were one of them. I was so intimidated when someone pointed you out and said, "That is THE Lee Kolbert!" 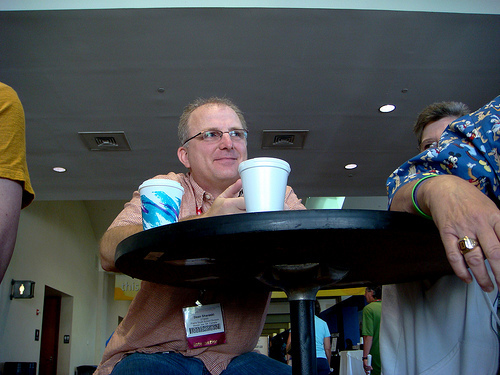 The next spring I was totally blown away when you helped connect Ben and Steve of VoiceThread to the ISTE Newbie Project. I will forever be grateful for that. 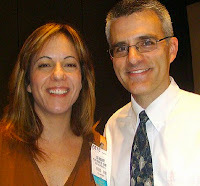 I met you for the first time in person at Edubloggercon in 2009. You invited Richard Byrne and I to have dinner with you, Collette, Wes, and Ben. I felt like I got to know you that evening. Thank you for including me that night. I think it was last month in DC in the elevator at Partners in Learning. Had we met before that? I learned a lot from you that day, I don't know if you knew that. Of course, I still think y'all just kept me around because I gave free massages. My life has been forever changed by meeting you. I just started reading your stuff, so you probably don't know who I am. Great blog! I'm sorry we keep missing each other, too. That's so kind of you to say but your videos (learnitin5)have contributed to my and many others' learning so much as well. Thank you for contributing here. I still have that small block of wood that you signed for me at ILC. Would you believe I keep it on my nightstand? We have not met in person but I know what you mean. We've certainly been connected for many years but I'm sure we've not met in RL YET. I look forward to that day, soon I hope. I DO remember now. Gosh, I remember that session and now that I see those photos, I NOW know many of those faces but I surely did not know them back then. I also remember you telling me that you recognized me from my profile pic. You are right that we only met in RL for a few seconds and it was last month, but we've connected online before and many times. This post is asking that question, "How/When did we first connect?" I know we did a live podcast together with Lorna about a year or so ago, but I'm sure there were other times. Yup, it's all about the massages. ;) You, my dear, have come a long way, Baby! Fascinating post...you always get me thinking, Lee. I remember hearing about you from DEN folks back in 2008. I think that's when I first started following you on Twitter and learning from you. I continued to "stalk" you as I contemplated my use of twitter in Ed, but it is partly because of you that I finally made the leap and started sharing more openly. It was either DENSI 2010 or back in March at your tech conference that we had our first face to face. Lee, I really have a hard time remembering when we first met, because you seemed to be a sister from another mother for years and years. 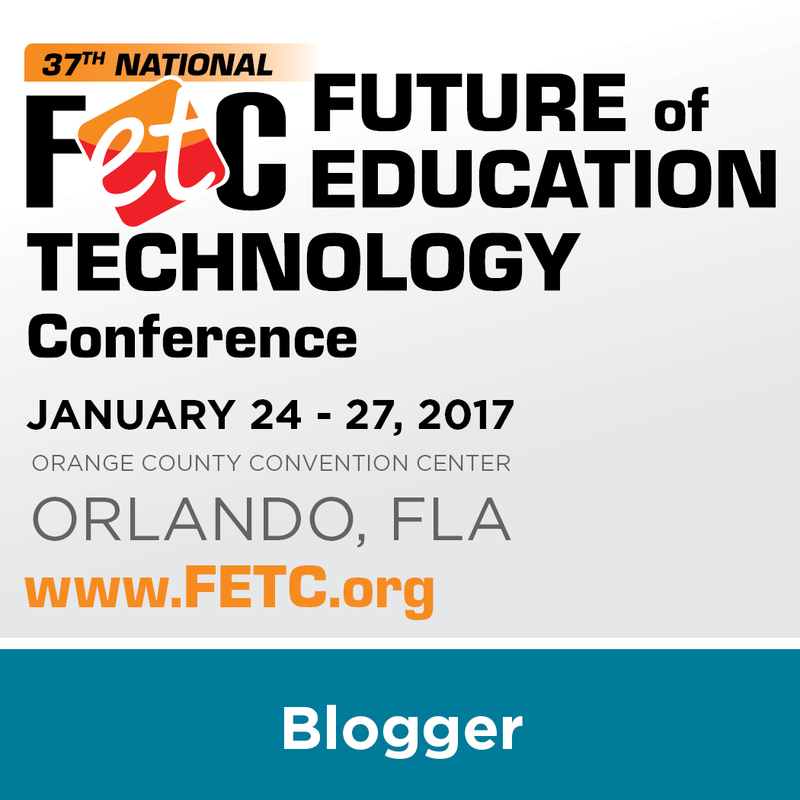 As I did the first FETC podcasts (Conference Connections) 2006, 2007, then 2008, 2009 - I have been in awe from beginning at how you share and include others. You are a powerhouse at many levels... so my first memory of when you recognized me in person was as I left one of the hospitality/workshop suites (may have been Discovery) and you hollered at me from 100 feet away "Shupester!". 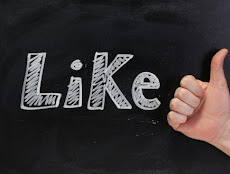 That made me feel really good because I never would have guessed you really knew me - I am always scanning for your posts and blog entries, because you have such keen balance of professional and personal connections in what you do and communicate! I'm pretty sure our first in person meeting was at this summer's Innovative Educator Forum. We may have crossed paths at one or another ISTE (it seems unlikely we didn't) but if so it was far too fleeting. It's hard to remember a time when I was involved with Discovery and you weren't also a part. Thanks for your kind words. I'm so glad we're in this together, now. 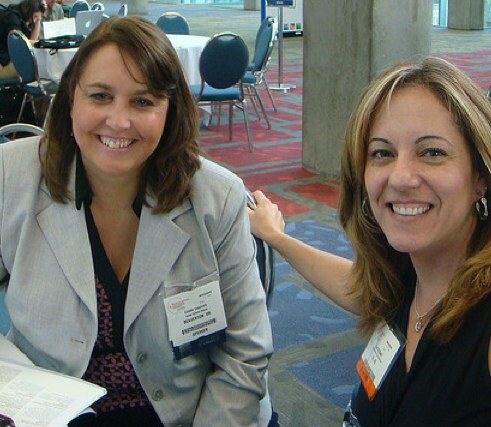 I remember meeting you at FETC a few years ago. You were doing a podcast with ... was it Phillip Cousteau? But I knew you before that from our interactions online. That's what I can't put my finger on. Thanks for saying all that stuff, but I'm in awe of YOU and your talent! I thought we might have met at a previous ISTE, no? Thanks to everyone for humoring me with this awesome walk down Memory Lane. It really does make you stop and think about the REAL relationships that can be built online. We are the people who "get it" and every day, more and more people are starting to "get it" too. I meant to reply to this ages ago... in any case, I can't believe we only met in 2009!